A recent Forbes article called robotic process automation (RPA) “a gateway drug to artificial intelligence (AI)”. In other words, RPA, provides organizations with a low barrier to entry into the AI world along with many of its benefits. Call it dipping a toe in the AI waters. What’s clear is RPA is on a tipping point. But will this growth continue? 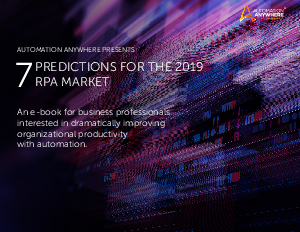 In this e-book we explore 7 predictions for the RPA market in 2019 from the market-leading platform, Automation Anywhere.